The Patrol Leaders' Council is finalizing the 2012-2013 program. Look here for updates. The Troop does it's annual bike trip. This time the target is the will tackle the 20 mile+ Shining Sea bikeway on Cape Cod. We'll camp at Camp Greenough in Yarmouth, MA. Up in the air, junior birdmen. 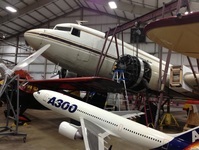 Troop 17's Scouts will experience the wonders of flight at New England Air Musuem in Hartford, CT (near Bradley Airport). We'll be camping inthe Bozrah, CT at the Mark Greer Scout Reservation, right along the lake. Scouts are preparing an fnternational feast for dinner, too. Practice Hike #1 :Jan 6th (Sunday)- meet at 8am at the OCC. Practice Hike #2: Jan 27th (Sunday)- meet at 8am at the OCC. The Troop will spend some time exploring the caves in Howes Cave, NY. If there is time, a side trip to the Baseball Hall of Fame in Cooperstown, NY might be arranged. All good plans need a good backup. After the PLC's plan to work on the Engeering Merit Badge found some major obstacles, the PLC masterfully has crafted a wonderful "Plan B" trip. The Troop will stay at Camp Sayre, then head into Boston to scour the city for the historic, the cool and the odd, as they participate in a Patrol-based photo-scavenger hunt. The winning patrol wil gain control of the coveted "Golden Rodent" award. We'll water taxi out to Lovell's Island to have a great view of Boston and the Inner Harbor. Camping will be at nearby Wompatuck State Park.